SolarWinds® AppOptics™ APM tools help you trace and troubleshoot application bottlenecks, and alert on issues before your customers notice. 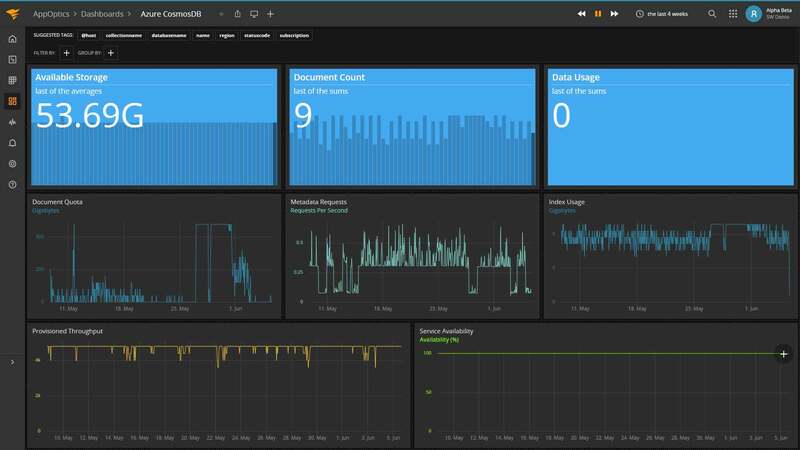 With unified dashboards and alerting, you can monitor application and infrastructure metrics side-by-side to get to the root cause of performance issues and resolve issues quickly. Automatically trace requests through multiple services and hosts. You can easily identify bottlenecks and performance issues, even in complex systems. Use advanced composite metrics available out-of-the-box to get actionable insights and expedite troubleshooting. With an easy configuration and fast onboarding, monitor application performance across all major platforms. Stay on top of everything by viewing your infrastructure and APM metrics side-by-side. Also, get automated alerts through the dashboards, third-party notification systems, etc. AppOptics helps you track or trace every request and analyze trace-related data using numerous criteria, filters, and visualizations. Use heat maps, which display request latency to help you quickly identify outliers and dig deep to resolve issues. Search for a specific trace across caches, database, queries, and remote service calls. Click on a transaction trace to get complete details of each service used to complete that transaction. Define custom and higher-level metrics for different services powering your application for in-depth analysis and faster troubleshooting. Define advanced metrics to satisfy your unique requirements, including business metrics. Combining metrics on a dashboard, like the number of users performing an action, and the cost and the revenue generated by a transaction to the temperature of racks in your data center, allow you to get a holistic understanding of the availability and performance of the application and the impact it has on the business. AppOptics supports the major frameworks and programming languages, and also provides auto-instrumentation to simplify the onboarding process. Monitor Go, JVM, .NET, Node.js, PHP, Python, and Ruby performance (more details). Start tracing requests and gathering metrics within minutes with a quick onboarding process. Unlike some other APM software, AppOptics does not require manual instrumentation for APM monitoring. AppOptics helps you draw graphical insights from your infrastructure and APM data from a single unified interface. Compare server, infrastructure, and APM metrics from a single dashboard. Customize your dashboard, perform import/export operations, and share your dashboard. to keep your team updated. The need for alerts when thresholds are being exceeded shouldn’t naturally translate into endless alerts. AppOptics gives you the ability to define and receive actionable alerts and reduce false-positives. View all enabled alerts and their current state to drill down and troubleshoot issues. Link alerts with notification services such as AWS SNS, Email, Flowdock, Slack and more. Our elastic pricing tracks the number of hosts you monitor along with your custom metrics and bills you for your actual usage. Additionally, you can save up to 16% with annual billing. Our host pricing is simple and affordable, providing you with out-of-the-box metrics and custom metrics for each host. For accounting actual usage, you are billed only for host-hours you use—not the highest or peak that some others use, but actual usage. Our APM host cost includes infrastructure monitoring for that host, so no need to pay for both. APM pricing along with lower-priced infrastructure hosts combine for a powerful and very affordable solution.